Note: We have created a modified program for the Sherline CNC Rotary Table Controller to allow it to drive other rotary tables. If you already have a rotary table and wish to utilize our controller, send us an email. You will need to use the Sherline 23 frame stepper motor with 1/4" shaft and 120 oz/in of torque. We also need to know the worm gear ratio of your table. Currently we support 40:1, 60:1, 72:1, and 90:1 ratios. Others may be available on request. CLICK HERE to see our system mated to a six inch import rotary table. 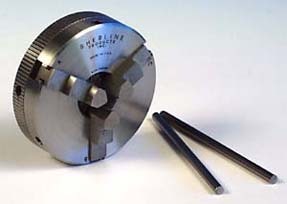 Mumford Micro Systems has developed a hand-held electronic controller to drive a small rotary table made by Sherline Products in Vista, California. This intelligent controller is used to automate repetitive machining and indexing operations on Sherline's CNC version of their 4" rotary table. 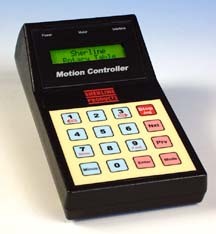 The controller features a 16-button keypad for entering commands and parameters, and a 2-line by 16 character backlit LCD display. The table can be used for circular cutting operations on milling machines or for rotary indexing in a variety of situations. 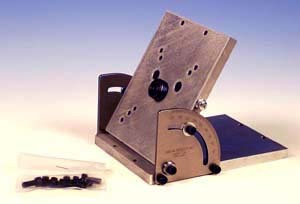 It can also be mounted to the headstock of a lathe to index for clock wheel cutting, eliminating the need for dedicated index plates. It is a self-contained computerized tool that needs no other CNC equipment to use, though it can interface to other CNC controllers if you have them. In the Division Mode, you can specify the number of divisions in which to divide one rotation of 360 degrees. For example, if you wish to index a clock gear with 36 teeth, you would enter "36". Then, every time you press the NXT button, the table will rotate 1/36th of a rotation. You can press PRV to step backwards 1/36th of a rotation. The table automatically takes up backlash, and you can program the amount of backlash correction. The LCD screen keeps track of the current position and tells you which step you're currently at. In the Degrees Mode you can enter an explicit number of degrees to rotate. For example, you might enter "120.050" degrees. Then, every time you press the NXT button, the table will rotate 120.050 degrees. You can press PRV to step backwards 120.050 degrees and the table automatically takes up backlash. The LCD screen keeps track of the current position and tells you what the step size is and what position you're currently at. The Program Mode allows you to enter up to 40 steps in each of two different programs. Each step specifies a number of degrees to move either clockwise or counterclockwise, the feed rate for that move, and whether or not to pause after execution of that program step. As you enter the program you can INSERT or DELETE steps if errors are made. After a program is entered, each press of the NXT button advances the table to the next program step. The LCD screen keeps track of the program sequence and tells you what the current program step and size are. Programs are retained even with power turned off until they are changed by the user. A separate button is provided as a Panic Stop and to put the controller in Jog Mode. This will instantly halt all motion and disengage the the stepper motor. There is a hand crank on the motor shaft, allowing the operator to turn the table by hand. The keypad can also be used to rotate the table clockwise or counterclockwise at the current feed rate or in very fine individual steps. The resolution of positioning is .0125 degrees. Each step is within .0064 degrees of the exact position requested. The motor has a holding torque of 110 oz/in and speeds as fast as 50 degrees per second can be acheived. Ramping is used to achieve the higher step rates, and a Setting Mode allows you to enter the ramp values. Power is provided by a 110 volt AC adaptor. The motor drive is a 24 volt, 2 amp current limiting chopper design with 32 step microstepping for smooth motion. It includes an interface connector for connections to other CNC controllers. The interfaces include step and direction input and sense and acknowledge protocol for remote operation of the program sequences. Ray Bates, a clockmaker in Newfane, Vermont, has recently mounted one of the rotary indexers to the headstock of his South Bend lathe. He'll be using this setup for clock wheel cutting, eliminating the need for indexing plates. To see pictures of his setup, CLICK HERE. 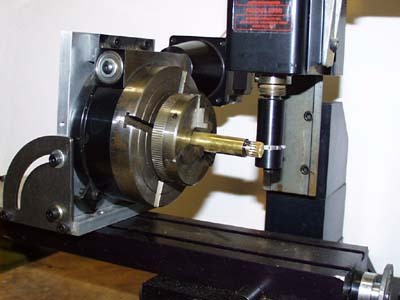 To see a similar setup, with the CNC Rotary Table mounted to the headstock of a Sherline lathe, CLICK HERE. It's also possible to use the Sherline CNC controllers as step and direction motor drivers for CNC software. To read about this, CLICK HERE. 3 Jaw Chuck, 2.5" O.D. Mounts to the center of the rotary table to hold workpieces. Tilting Angle Plate. You can bolt the rotary table to the angle plate and position it at any angle. Includes holdowns. 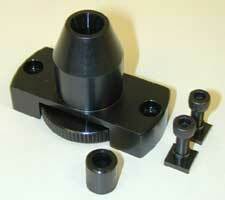 WW collet holder. Mounts to the center of the rotary table to hold workpieces.